When it comes to subway station renovations, it turns out that sometimes, you can put lipstick onto a pig. 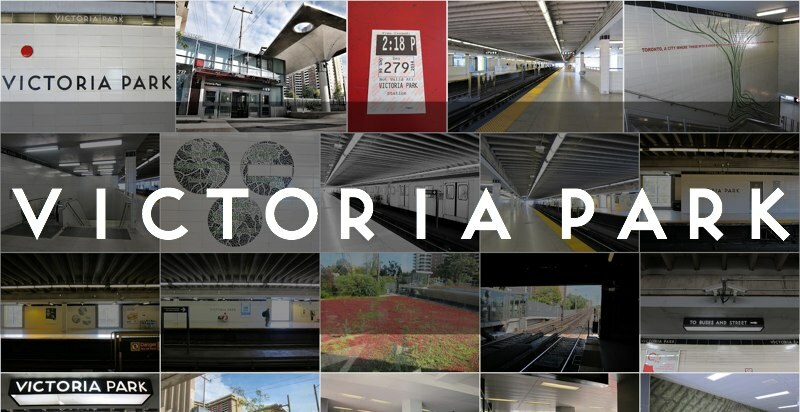 Prior to a comprehensive, multi-year, $36 million rehabilitation that culminated in 2011, Victoria Park suffered from an inefficient transfer layout. To go between the subway and the elevated slotted bus platform, you had to traverse down a flight of stairs, dash over to the correct bay, and then clamber back up again. The design was cutting-edge for a 1968 station where buses were in a separate fare zone, but it no longer served us well in the present. And it was ugly. Wonderfully ugly! I would have rejoiced in documenting it prior to the enhancements. Externally a concrete bunker (rather like its expansion-sister Warden), Victoria Park imposed itself onto the senses, aloof to the local topography. I invariably regard ‘revitalizations’ with distaste. Progress, and the upheaval it entails, is the notional enemy of my arbitrary nostalgia for the way things were when I first encountered them. But I can occasionally express grudging acceptance, when the improvements are clear and incontrovertible. The modernization effort strove to recast Victoria Park as a connective intermodal hub for the community. Brown+Storey Architects (known for their design of Yonge-Dundas Square) guided the site’s urban design elements; Stevens Group Architects along with the TTC’s internal team were the project architects; while Scott Torrance Landscape Architect implemented the extensive and innovative 5,000 square-foot green roof. Meszaros’ wide-ranging, somewhat rambling installation is called Roots. It takes various forms throughout the station, some better executed than others. My personal preference is for the filigree, laser-cut panels in the north bus plaza canopy. I haven’t yet figured out the right time of year to properly view the ‘global’ shadows they cast. If you just glance up at the circles they look random, but a closer inspection reveals the reversed images of the world’s continents. Victoria Park traces its nomenclature back to the British monarch who reigned over the Empire during the latter’s era of maximum puissance. Her namesake station may never be as beloved, but thanks to the award-winning refresh, it is now far less forbidding than when its doors opened on May 11, 1968.